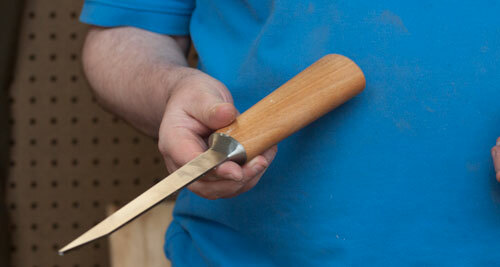 When Ray and I first spoke about him making mortise chisels for me we wanted the full range from 1/8 - 1/2" by 1/16". About a year later the first prototypes showed up, and soon after the rest was history. 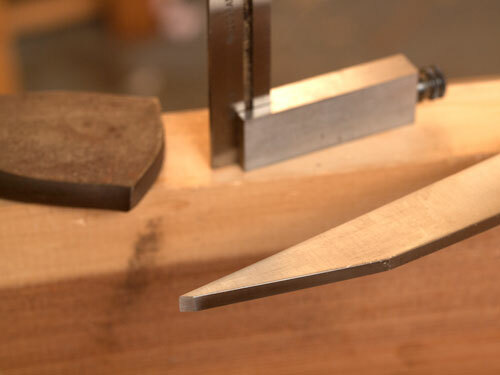 Ray is currently the only maker of traditional English oval bolstered mortise chisels and his guess is that they haven't been made since just after World War Two. He is making them with a oval handle that is flush to the bolster (and hand fitted as a consequence) a process that really wasn't done much if at all since Victorian times. Ray had to figure out how to make these chisels from scratch and once in the early days he called me all excited because he could not figure out how to grind something using a traditional method without leaving some peculiar grind marks. He was tickled pink to tell me that when he looked at some old mortise chisels of the same size - they had the same grinding marks. He also could not figure out how to make a 1/8" chisel. It would be possible he said but really really hard. If you happen to have an old 1/8" mortise chisel you know how dainty they are and how they just disappear into the wood on narrow joints. I made a mortise 1 1/2" long x 1/8" wide by about 3/4" deep in something like 4 stokes and a little cleanup. Anyway - flash forward five years and the chisels have been a big hit but still no 1/8" chisel. Then about a month ago I was on the phone with Ray and he said he had just finished up a batch of 1/8" chisels and was starting on the 1/4". "Backup" I said. "What did you just say?" "I just finished up a batch of 1/8" chisels and the 1/4" are well underway". he said. "I thought you couldn't figure out how to make them" I said. "Well I figured it out." He said. So we have 1/8" mortise chisels in stock. They do take a little more work so they are a little more expensive than the 3/16". The 5/16" and 1/2" which are out of stock at the moment are expected reasonably soon. You can read more about the chisels and order here. Oh thats a Mortising Chisel,.at first glance It looked like a fileting knife.